Latest News:Sell your domains on the EstiBot Marketplace! EstiBot is the most trusted name in domain name valuation, appraising over 2 million domains per day. Access professional grade research and investment tools for experienced and novice domain investors. Identify new trends by utilizing the industry's most comprehensive data sets and reporting technologies. Domain names are the real estate of the online world. They are attractive investment vehicles which offer low entry and maintenance costs. EstiBot helps identify valuable domain names and provides the data necessary to make an informed investment decision. Unbiased, statistically derived domain name appraisal you can trust. Your go-to place for domain name investment decisions. Instantly appraise one or one hundred thousand domains. Look up keyword bids and search volumes in bulk. Generate lists of businesses that may be interested in your domain. Access daily updated lists of over 250,000 expiring domains. 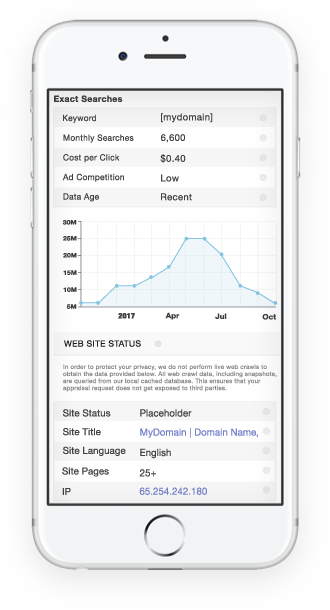 We analyze over 200 million domain names daily to determine the latest trends. Monitor the value of your portfolio and get alerts when new end-users are discovered. Subscribe and get started with EstiBot.com today!